Amino acids are the building blocks of muscle. Every delineation of bicep, pectoral and abdominal muscle is achieved because of the body’s ability to synthesize the amino acids that we get from our diet. It’s not enough to say they are important…they are everything! With that in mind, let’s take a trip down amino acid lane and learn about amino acid supplements and how they can help you build even more muscle. You need to get the right amino acids to build your body the right way. There are 20 different amino acids that comprise the protein in the human body. Out of these 20, 11 are considered non-essential and nine are considered essential. The essential amino acids can only be obtained through the food that you eat. Getting your protein from your diet is essential, but supplementation goes a long way to ensuring that you will always have adequate reserves of these vital substances. 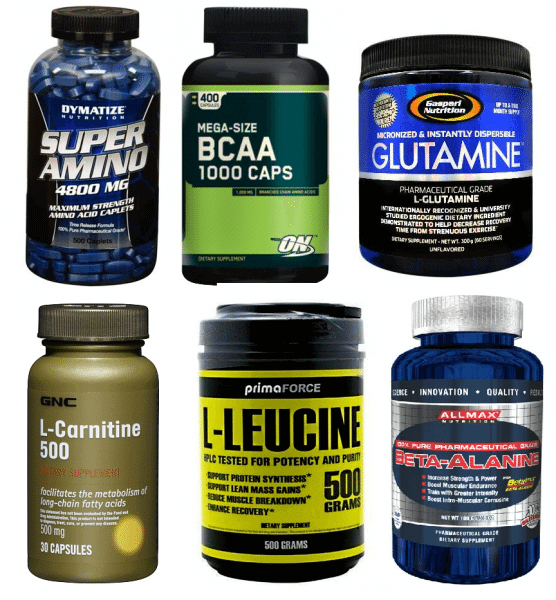 The supplemental form of glutamine is L-Glutamine. This is actually one of the non-essential amino acids, but it’s also extremely important in that it aids the body with memory recall, concentration and helps the body rid itself of excess nitrogen. Bodybuilders need adequate amounts of nitrogen, but too much can impede muscle growth. As a supplement, glutamine is important because the body often uses glutamine stores as a source of energy in the place of carbohydrates. When the body uses glutamine instead of carbs, that means it’s breaking down muscle tissue…and you don’t want that! Supplementing with glutamine will ensure that you have enough on hand to preserve that hard earned lean mass. Branched Chain Amino Acid’s (BCAAs) are a combination of three different essential amino acids: leucine, iso-leucine and valine. These are vital substances because they help to manufacture, repair and maintain your muscle tissue. While it’s true that these amino acids can be found individually, the best results are obtained when taking them together in one supplement, because in the supplemental form they come in the correct ratio. The most effective ratio for taking these amino acids are 2:1:2, respectively. Methionine is an essential amino acid that helps the body break down and use fat. This breakdown of fat helps the body produce more testosterone, so it’s a very important amino acid for bodybuilders. Methionine is also used in a supplement along with zinc, magnesium, and vitamin B6. This combination of substances helps bodybuilders with digestion and improved sleep. Taking methionine in a ZMA supplement will help your body break down fat better. It will also help you sleep better, so you can recover faster and get back in the gym to build more muscle. Histidine is also one of the nine essential amino acids and it aids the body in the repair and growth of tissue. It also works to protect nerve cells, helps the body remove toxins, and aids in digestion. As a supplement, histidine has been shown to help improve digestion, while imparting few additional benefits. For bodybuilders, lysine or l-lysine is a critical amino acid supplement. L-lysine helps the body with calcium absorption, maintaining lean mass, balancing nitrogen and helps with producing antibodies and hormones. Lysine is very important to bodybuilders because it helps fight fatigue, the negative effects of over-training, and helps the body maintain a positive nitrogen balance. This keeps the body in a state that is conducive to muscle growth. This essential amino acid works in conjunction with glutamine to improve memory, helps with normal functioning of the nervous system and also helps the body absorb UV rays from the sun, which helps produce vitamin D. For bodybuilders, this amino acid helps with the all-important contraction and relaxation of muscles. Threonine is another amino acid that carries a host of important functions with it. It helps the immune system, the liver and helps break down fats in the body along with other amino acids. It also assists in the formation of collagen and elastin and, most importantly, helps to maintain protein balance. Bodybuilders benefit from additional supplementation because of its ability to balance protein in the body. Amino acids are working all the time to keep your body healthy and strong. They are responsible for tissue growth, memory, protein balance, just to name a few functions. By taking additional supplements, you know that your body will have all the resources it needs to keep you healthy and help you keep building muscle day after day.